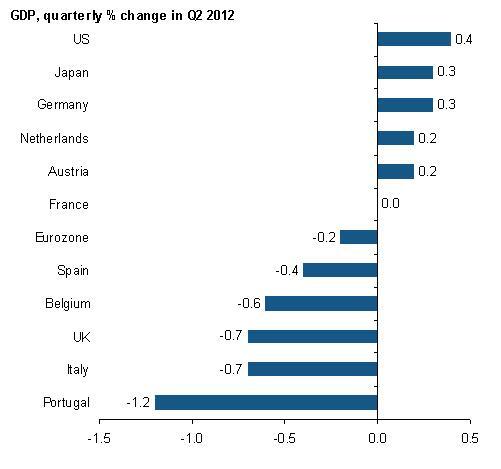 This chart show the quarterly economic growth (second quarter versus the first quarter of 2012) for the countries in the Euro Zone, compared with the United States and Japan. What is interesting is that most Euro Zone countries saw their economic growth far below the U.S. and Japan, especially Portugal and Italy. Not being in the Euro Zone is not a guarantuee for economic growth though, as you can see with the -0.7 percent contraction in the United Kingdom.